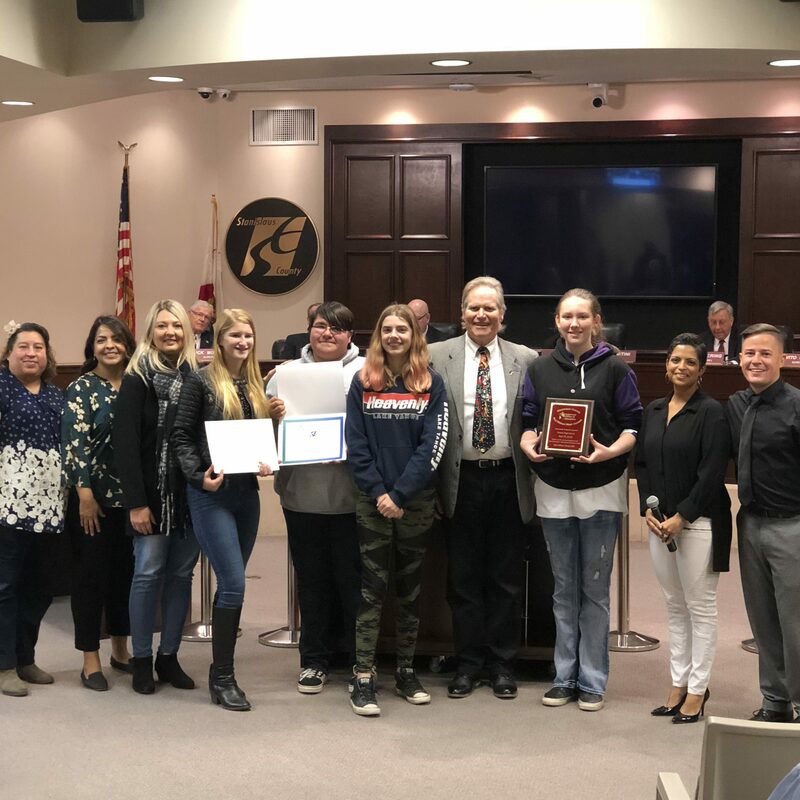 For the second year in a row, Denair High School was honored for the enthusiasm, participation and content of its programs associated with Red Ribbon Week in October. The Coyotes finished third among all the high schools in Stanislaus County. In 2017, Denair was second. Schools across the country celebrate Red Ribbon Week, which began in 1980 as a way to discourage drug use among children while promoting healthy behaviors. Former First Lady Nancy Reagan was one of the original proponents. High school, middle school, and elementary campuses were evaluated by officials from the county Office of Education, who made site visits. They used a point system that factored in student, staff and parental involvement as well as decorations and signs associated with Red Ribbon events. At Denair High, student members of the PHAST (Protecting Health and Slamming Tobacco) Club worked with staff advisor Melissa Treadwell to orchestrate an informative and fun series of events. A wrecked car was placed on campus all week to demonstrate the dangers of driving under the influence of alcohol or drugs, or texting and driving. Also this year, students could wear “Drunk Goggles,” which simulated what it was like to be impaired. Teens had to try to walk a straight line while wearing them. Treadwell said the judges rated Denair perfect in three areas – parent and community involvement, activities schedule and portfolio (which featured aerial images taken by a drone flying above the campus). “The drone footage captured unique angles and we could tell that a lot of work and effort was put forth by students, teachers, staff and parents!” read the report of the SCOE judges. “The kids did a great job coordinating everything,” said Treadwell, who joined some of the PHAST Club members on Tuesday to pick up their award at the county schools office in Modesto. Hughson finished first among high schools and Elliott Education Center was second. Denair Principal Kara Backman said Red Ribbon Week is an important part of preparing teens for the future and teaching them to make good choices. Posted in News and tagged Red Ribbon Week. ← Denair Football Team Wins State Championship!